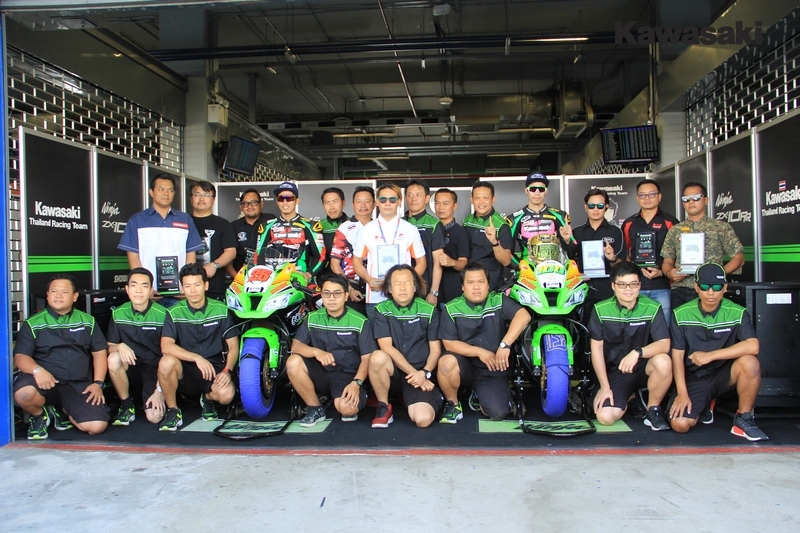 "Kawasaki Road Racing Championship 2019"
"Kawasaki Enduro 3 Hrs. 2018"
Kawasaki was an early winner in the Riders’ Title chase, thanks to Scott Russell in 1993 and more recently in 2013, 2015 and last year. Tom Sykes was champ in 2013 and Jonathan Rea in ’15 and ’16, each on their Ninja ZX-10Rs. Shouldering a heavy weight of expectation for 2018 KRT, and riders Jonathan Rea and Tom Sykes, have a mountain to climb this year as new rules imposed to stymie a perceived Ninja dominance rob the rev hungry ZX-10RR of over 1000rpm to try and close the gap between leaders and chasers. Sykes enjoyed his first Superbike World Championship wildcard rides in 2008, when he took a second place finish against the more established riders on his home soil. He has not always been a four-stroke star, having preferred the feel of two-stroke racing bikes in his early career. Competing on his grandfather’s 600 Kawasaki road bike for a short time in the UK, just to understand how a four-stroke machine worked around a circuit, Sykes soon moved into the British Supersport Championship on a full-time basis. He enjoyed almost instant success and was runner-up in the 2006 season. Paul Bird Motorsport picked up Tom for a season of BSB racing in 2007 and five podium places contributed to a fine top six ranking, in arguably the toughest domestic championship there is. A year later, having posting race wins in the UK series for another team and also taking a podium in the British round of the World Superbike Championship, Tom was in a strong position to be signed for WSB full time in 2009. A tough first year, marred by injury towards the end, was not in Tom’s pre-season script, but he did impress on occasion and finished ahead of many bigger WSB names. In 2010 – and now signed for Kawasaki - it took some time for Tom and his team to get the very best out of that generation of Kawasaki Ninja ZX-10R. After a victorious return to BSB racing for a one-off meeting at Brands Hatch the final few SBK races brought strong double-digit points scores, and almost saw Tom back on the podium again. For 2011 Sykes was retained to help develop and race the all-new Ninja ZX-10R, tasks which brought rewards as the bike blossomed as a real force at a variety of different circuits. Almost from the start of the year Sykes was posting performances that finally won him his first race victory at this global level. The 2012 season was another positive turning point for Sykes as he scored four race wins and a gigantic tally of Superpole prizes for being fastest qualifier. His championship win in 2013 was the highpoint of his career – so far. Only missing the title in 2014 by six points, he was only 17 points from second place overall in 2015. After a strong season laden with race wins and podiums in 2016 he earned the runner-up spot. Last year several off-track and one major on-track misfortune made it a remarkably tough season for Tom, with illness affecting his early season rides and late season injury robbing him of valuable points. Sykes is looking at 2018 as a season to challenge once again for the top spot, despite regulation changes designed to negate the cutting edge of his Kawasaki’s maximum engine revs.